Yesterday included my annual pilgrimage to the Great Minnesota Get-Together, otherwise known as the Minnesota State Fair. For most, this is a venture into the exploits of gluttony; corn dogs, pork chops on sticks, buckets of chocolate chip cookies, and mini donuts washed down with all the milk you can drink for a buck. For me, it is a metaphysical event; laced with spirits from the past and traditions not yet established. Yes . . . and a temporary lapse into the exploits of gluttony. I can sense my mother is within me when I start to hum the theme song from State Fair. It was our song on the drive from Fridley to the fairgrounds every year. Mom actually called in sick for me at school, just so we could go together when the crowds were lower. We arrived before any attractions opened, and sometimes before the kitchens. After eating breakfast at the Pancake House, which no longer exists, we would head straight to the Creative Arts Building. If we timed it right, we would be among the first to enter. There she strategically surveyed each and every piece of handiwork on display, critiquing the judges as much as the crafters. This year I passed up the Creative Arts Building. Experience has taught me that it no longer holds magic without the magician by my side. But I smiled at the women waiting patiently outside the unopened doors early yesterday. I ate breakfast sausage on a stick, followed by a double latte with sugar-free vanilla. Really? Sugar free? Was that a feeble attempt or force of habit? I dipped the breakfast sausage corn dog in real, full-strength, high fructose-laden maple syrup. Nutrition is a balancing act, after all. I only walked another block before the tears came. What set them off, I can no longer remember. But they came, and I searched for a direction to face in order to hide my sudden display of grief. This is an expected reaction, a tradition since my mother’s death; merciless in its timing, yet cleansing upon its arrival. My kids visited the fair with my mother and I a couple times. Those years Mom always went twice, just so she could spend more time seeing the things she wanted to see. When you have children in tow, there is a different perspective of the place. Sailing down the big slide is something I hadn’t done since I was a child, and probably not again until I have grandchildren. One year we saw piglets being born. The kids and I had our own song we sang on the way to the fair. Bubba thought about coming with me. Everyone thinks I’m crazy for going alone, but I prefer it. My favorite parts are the talks and demonstrations. Sometimes I can hardly make it from one to the next, weaving through the crowd from the Agriculture Building to the Progress Center in ten minutes flat. If someone is with me, I won’t put them through that. I learned a lot about pollinators and rain gardens yesterday. I gained resources and education on things like systemic pesticides and edible landscaping. I logged over 20,000 steps, necessitating a half hour break in my car with my shoes off and feet out the window. I texted and Tweeted, took selfies and Instagrammed. I’m just not one to let being by myself hinder my fun. One of the things Mom used to do before we left the fair every year was to have a beer. She would say that nothing tasted better than an ice cold beer on a hot day at the fair. And so I stopped in the Beer Garden before heading out. I sat there, by all outside appearances alone, and drank to memories, to tradition, to sore feet, and to next year. I do believe that nothing has ever tasted better. What lively and lovely memories of your mum…. And I do so like the idea of you with your feet out of the car window. Long may you continue to visit. 🙂 “Mum” is how my grandma used to sign her name at the bottom of cards she gave my mother. I love that! Thank you! 🙂 Your grandma was English or British then I’m guessing? Jean, your writing is getting more and more profound in its seeming simplicity, yet there is nothing simplistic about it. I sense a calm in your observations, thoughts, and feelings (as well as your marvelous humor! ); a kind of “zen” distance (which is very much connected to things, as opposed to “distance” in the lone ranger/solo hero sense so prevalent in America). As my family roots are in Minnesota, I love your stories about things I’ve never seen but imagine that my grandparents and dad and aunts did. And your words about your mom touch deeply, as you know from reading my blog. My ‘tradition’ of tears is still going four years later. Thank you for a beautiful post. NIna. What a beautiful comment. Writing has been such a therapy for me, and I do believe it has brought about a sense of calm to my life. I feel a connectedness to people, things, time that I think I lost track of for a while. Thanks so much for taking the time to read and comment. I so agree with what umbriascribe	said. I loved going to the fair with you and get the need to do it alone to savor the memories. I could feel your tears and why they came. You write so expressively I’m glad you didn’t get to deeply into the food part. I would have gained a pound from the description. Nothing tastes as good as a cold beer with someone you love on a hot day. Ah! That is so sweet. While I was there, I was really wondering if I could capture in words what I was feeling. I love the fairs and like you prefer to be alone so I can dawdle where I want and skip other things. 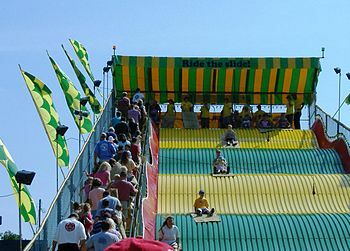 You were so lucky to have your mom call you off of school for the fairs. There is much we can learn (and enjoy) outside of the classroom. Yes, I still feel a guilty pleasure at the thought of it. She used to tell me the day before to not look too lively, so it was believable! I wonder if I went back to school with a sun-kissed cheeks the next day? Ha! Museums, shopping, the state fair, and my favorite foods are all best enjoyed alone. I suppose it is that introvert in me.